It tugs at the heartstrings of any parent: children who are living with a level of fear or worry that interferes with everyday life. Anxiety disorders affect 6.5 per cent of children yet only a tiny proportion of families manage to access evidence-based treatment. Professor Cathy Creswell, a developmental clinical psychologist, has been working to improve that picture. 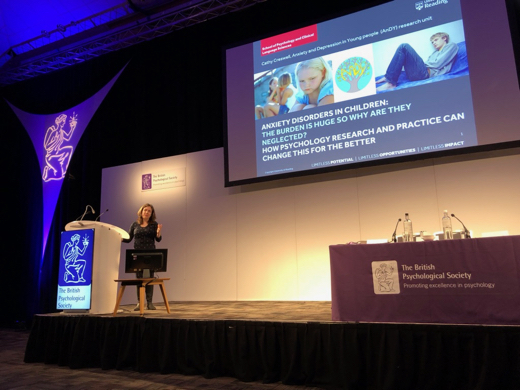 Creswell, also Joint Director of the University of Reading Anxiety and Depression in Young People clinical research unit (AnDY), opened her keynote with some startling figures. More than a quarter of people will meet the diagnostic criteria for anxiety disorders at some point in their lives, and the cost to society is higher than for any other mental health disorder: billions lost due to lost earnings or unemployment. Anxiety disorders also have a particularly early onset, with half of people’s problems emerging before the age of 12. Cognitive behavioural therapy (CBT) has been shown to be effective in around 60 per cent of children affected by anxiety. However, Creswell pointed to research with Tessa Reardon and Kate Harvey which found only 38 per cent of families had accessed support of any kind, while just 2 per cent of these had received CBT. Why hadn’t parents managed to access support? Creswell’s team pointed out that anxiety problems come and go in phases; parents are often not sure if it is ‘normal’; they may fear their child being labelled; they may feel a sense of blame or failure. Parents may also simply not know who to ask for help, or get pushed from pillar to post without finding an appropriate service. ‘It’s a leaky pipeline,’ Creswell concluded. So parents need help at an early stage, to nip problems in the bud. Creswell and her colleagues have set about thinking of ways to increase access to evidence-based treatments. She pointed to services such as Improving Access to Psychological Therapies (IAPT), which use a step care model whereby service users first have lower-intensity treatment which require fewer resources. If children do not respond to this they are stepped up onto a higher intensity therapy programme. Working with parents themselves, Creswell said, and giving them skills in CBT, combats many of the problems parents experience when trying to access therapy. Keeping treatment within the family and empowering parents to be part of their child’s treatment can allow them to feel they are part of the solution rather than part of the problem. This work led to the development of a CBT self-help book – Overcoming You Child’s Fears and Worries – which parents would read, and with help from a therapist to practice some of the techniques would then go on to help their children. After parents had just five hours of therapist-supported training, this approach was found to help children recover from their anxiety. In a randomised control trial this parent-delivered CBT approach was compared with a therapy which directly involved children – Solution Focused Brief Therapy. Both of these involve five hours of therapy for children or training for parents. Creswell found similar reductions in child anxiety for both therapy approaches, and had similar levels of recovery compared with more intensive treatments. Parent-delivered CBT is also cheaper than the solution-focused approach as it allows parents to have some sessions at home, at their convenience, requiring less time to be taken off work to take children to sessions. Creswell’s colleague Rachel Evans collected NHS data during parent-guided CBT and found significant improvements in outcomes. Around three quarters of families who used it were able to be discharged following the intervention. More recently she and her team have turned their attention to those families who don’t benefit from this lower-intensity approach to therapy. Many studies have shown children’s outcomes in traditional CBT are worse if a parent has an anxiety problem. In one study parents were trained to better tolerate their children showing stress or fear and helping children face their own fears (using a ‘what’s in the box?’ method… ‘Since I’m a Celebrity has been on, people assume we have much worse things in the box than we really do’). Parents who had this intervention were compared to those who had standard treatment and their children’s outcomes were the same – more than 70 per cent of children improved in both groups. This shows, Creswell said, that children whose parents are anxious can show marked improvement. ‘We need to help parents to tolerate their children’s negative emotions: to manage them while helping children to face their fears.’ But she is continuing to look for approaches which can better help those who may not benefit from lower-intensity therapies, including making the approach more accessible through the use of online and audio versions. - Find out more about Cathy Creswell's work.